Olbers' Paradox; or why is the sky dark at night? Introduction: Olbers and his life. Heinrich Wilhelm Matthias Olbers (1758-1840) was born near Bremen, Germany and spent most of his life in Bremen. Olbers was formally trained as a physician and is said to have developed a celebrated method for calculating cometary orbits while at the sickbed of a fellow student. Olbers’ method for cometary orbits is still extensively used, and his original publication of cometary elements in 1797 was expanded in later editions by Encke in 1847 and Galle in 1864. Olbers practiced as a physician in Bremen from 1781 until retiring in 1823. The upper portion of his house was fitted as an observatory, and he observed most clear nights. It is said he never slept more than four hours. He discovered the great comet of 1815, which is named for him. He is also noted for his re-identification of Ceres and his discovery of Pallas and Vesta (Moore, 2002). Because of Olbers’ stature as an astronomer, his simple but entirely serious question “Why is the sky dark at night?” is now known as Olbers’ Paradox, even though he was not the first to ask this question or the first to seriously consider it (Moore, 2002). The Paradox: Why is the sky dark at night? At first, this seems like a silly question. It’s dark at night because the Sun has set, and the Moon and stars are too dim to produce much light. But Kepler, Halley, and Cheseaux before Olbers pointed out that if we assume the Universe is infinite, and there is an infinite number of stars, as was generally accepted, then each spot of the sky should be occupied by starlight. In 1826 Olbers published his paradox questioning why the sky is dark at night. He noted that even though more distant stars are fainter, there are more of them (Olbers, 1826). If we move the Sun four times further from us, we will receive 1/16 the amount of light, but the Sun will subtend one-quarter of the area, and its intensity is unchanged. In fact, assuming that other stars have surface temperatures the same as the Sun (~5800 K), then we should see the sky as if we are in the center of a hollow black body whose temperature is about 6000 K (Chase, 2004; Struve, 1963). The sky should be as bright as the Sun in all directions at all points. Olbers’ Paradox has bedeviled astronomers and physicists since the 18th century, and it continues to be examined in a serious fashion even in the 21st century (Maddox, 1991). Phillipe de Cheseaux (1718-1751), a wealthy Swiss landowner, mathematician, and astronomer, was one of the first persons to examine the paradox in a formal manner and offer what appeared to be a reasonable solution. He proposed there is some absorption of starlight en route to the Earth. Olbers gave essentially the same explanation and felt the stars had not been shining forever (Moore, 2002). PG Tait writing in the 1881 Encyclopedia Britannica stated the paradox represented a finite Universe (Struve, 1963). By the latter part of the 19th century and the beginning of the 20th century, it was realized that absorption of starlight offers no explanation, because the absorbing material, mainly gas and dust, will simply heat up and emit the same amount of radiation, albeit in a somewhat different form (Chase, 2004; Struve, 1963). Other classical explanations include a) there is only a finite number of stars in the Universe, b) the distribution of stars is not uniform, and stars are hiding behind each other, and c) the Universe is too young to allow distant starlight to reach us. Sir John Herschel offered the explanation of a “hierarchical” Universe in which stars form galaxies, which in turn form galaxy clusters, and so forth without end. The result being that stars are not uniformly distributed in the Universe (Sky & Telescope, 1992). The classical explanations fail to solve the paradox. Stars and galaxies are not uniformly distributed on small orders of scale, but there are a near infinite number of stars and galaxies visible to us. When the Universe is looked at on the largest scale of 100’s of megaparsecs, it is uniform. Thus, we ought to see the light of galaxies if not individual stars in all directions. The sky between the stars and galaxies is actually not totally dark. There is approximately 0.0003 ergs/cm/sec of energy coming to the Earth in the sky between stars and galaxies. This is equivalent to a 25th magnitude star per square arc second of sky (Wesson, 1989). 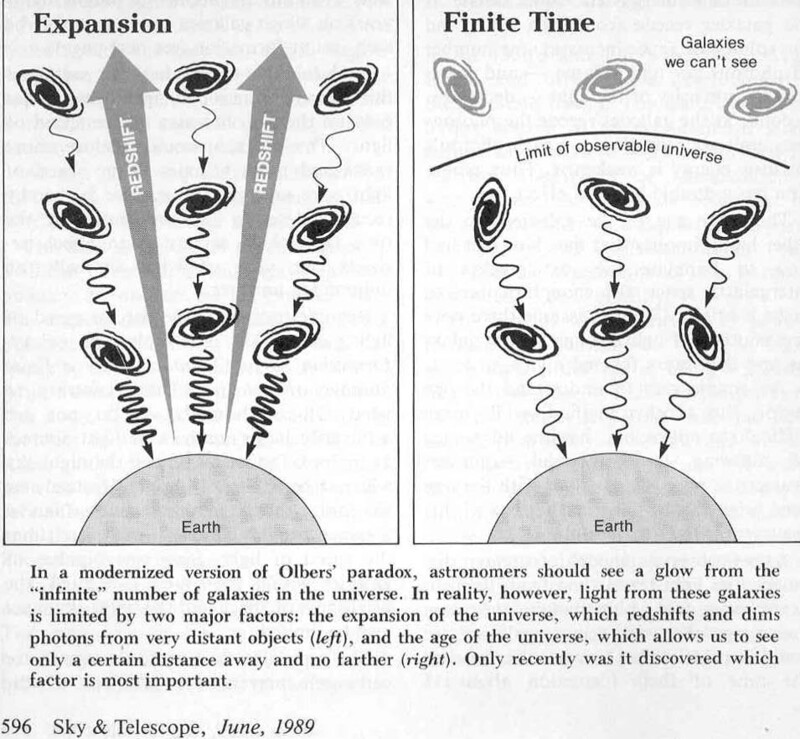 Modern cosmology in the 1980’s explained the paradox by the expansion of the Universe and the finite age of galaxies. As galaxies recede from us, their light is dimmed, because more photons are spread over an increasingly large volume. Also, their light is redshifted so the intrinsic energy of the photons reaching us is slowly but steadily diminishing (Wesson, 1989). Copyright © 2013 The Grasslands Observatory. All rights reserved.